Domestic carpet cleaning services prices start form as low as £35.00. 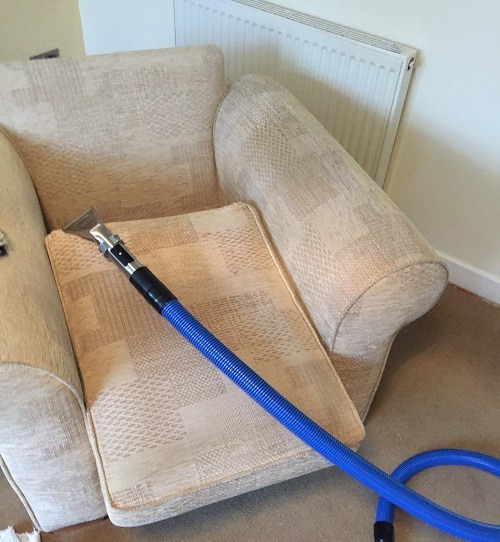 We use The Deep Clean system with hot water extraction; we pre vacuum your carpets, treat spots & stains, agitate the carpets then using our extraction machine to remove the dirt and soiling from your carpets this not only cleans your carpets but conditions them as well, thus prolonging the life of your carpets, leaving your carpets touch damp and dry within 2-4 hours. In a recent Technical Bulletin, Shaw Industries, the world’s largest carpet manufacturer ‘recommends the hot water extraction system, which research indicates provides the best capability for carpet cleaning’. Cloth upholstery can be both wet and dry cleaned, we test fibres for colour fastness to make sure dyes are stable, then we can clean your sofa or chairs leaving them clean and fresh. Leather is a type of upholstery material that can crack, fade, shrink and sustain permanent damage over time unless it is professionally treated on a regular basis. People prefer leather over other materials as it is soft, smooth and comfortable. The process of producing leather is tedious making this an expensive fabric however it is not expensive to maintain. Items in the home that can be cleaned include leather couches, leather seats and leather cushions. We use Products by Chemspec & Prochem to remove Stains and odours . These Products are environmentally friendly and will work in loosening the stains from your carpet fibres and then be rinsed completely to Leave your carpets fresh and clean. Our odour neutralizing product are designed to banish pet odours, vomit, urine, faeces, smoke, and other offensive smells. So what are you waiting for? Rid yourself and your family of those stains and smells. Our Mattress Cleaning Process extracts not only dust mites, pollen, mildew, bacteria, and viruses. Rid yourself and your family of these dust mites, and immediately reduce the symptoms of asthma, bronchitis, eczema, depression, fatigue, headaches and many other conditions which can be allergy related. Call us now and have your mattress cleaned and sanitized.